The name “Van Sweringen” holds a certain prestige and power in Cleveland’s annals of history. 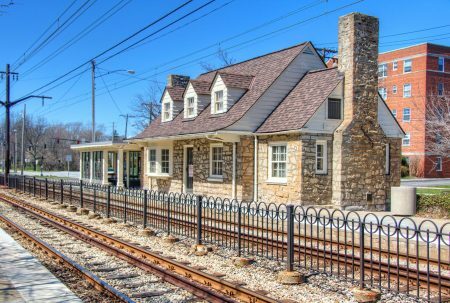 Known as railroad barons during the turn of the century, the brothers Oris Paxton and Mantis James are most notable for the development of an affluent village, which later became known as the ideal suburban garden city of Shaker Heights. Today, Shaker Heights is known as one of the most desirable communities in Cuyahoga County. The streetcar suburb is one of the oldest among Greater Cleveland’s inner-ring. Shaker Heights is particularly famous for its strict zoning laws and building codes, which helped the community maintain its identity as a city filled to the brim with architectural and historic treasures. So much so that about three-quarters of the city is included on the National Register of Historic Places! Cleveland has always been notable for its architecture, but the development of the planned neighborhood of Shaker Heights set things into motion. The Van Sweringen brothers bought the land and laid out the foundations to what is considered as the ideal suburban garden city in the country. Homes were constructed along the roadways, which was heavily influenced by the natural topography of the land. Thus, the usual grid layout often seen in urban cities is lost in Shaker Heights. Despite the informality, all the roads were carefully planned to eventually connect to main thoroughfares, making the community accessible without compromising the creation of beautiful home sites. After the road network was laid out, the Van Sweringen brothers purposefully blocked certain sections of the land to be dedicated for commercial use. Lots were then donated to religious and academic institutions so schools and churches can be built. To make the garden city truly a garden, the Van Sweringen brothers then started to plant trees. What was originally known as Shaker Village became incorporated in 1912 and officially became a city in the 1930s. Homes in Shaker Heights are wide-ranging, from humble single-family residences to sprawling mansions. The architectural scene, which started as rather eclectic in the 1920s, grew to become a melting pot of styles. The eclectic architecture of the roaring twenties eventually gave way to more “domestic” forms of architecture, as architects embraced styles such as Cotswold, American Colonial, English Manor, Elizabethan, and French. Despite the diversity, homes in Shaker Heights share common plans and scales, and the end result is a surprising uniformity as you walk along the streets of its neighborhoods. Schools, churches, and other community buildings were designed with the “domestic vision” in mind, with most of these facilities designed in styles such as American Colonial, English Gothic, Tudor, and Georgian. With all this, it’s safe to say that without the Van Sweringen brothers, there would be no Shaker Heights. The brothers had the initiative and determination to turn their dream of a garden city into a reality, and we all reap the benefits of their hard work today. In the end, the Van Sweringen brothers’ influence doesn’t stop at the city’s architecture, it extends to its foundation and development. You’ll never know what residential real estate treasures you’ll find in this great city. You can also read more about Shaker Heights here. For more home buying or selling tips, communities and Greater Cleveland Real Estate and Homes for Sale in Cleveland, Ohio, get in touch with the Top Realtor in Cleveland Michelle McQuade at (440) 823-2448 or (330) 257-8913.